"He said he was going to get his ammunition and gun." EDMONTON — A man has been charged after staff say someone phoned the legislature office of Alberta Environment Minister Shannon Phillips and threatened to shoot everyone over the carbon tax. Michael Enright, an oil products salesman from Camrose, says he didn't make any threats and was simply calling to voice his frustration over the hurt currently being experienced in his industry. Cheryl Sheppard of the Edmonton Police Service said Enright faces one Criminal Code charge of uttering threats. "I'm a very calm person." The call happened a week ago, on March 31, in the middle of the afternoon. "He was calling to express his anger over the carbon tax,'' a staffer in Phillips's office told police in a statement. "He then said he was going to get his ammunition and gun and come here and shoot us all,'' the statement reads. Sheppard said Enright was charged later that day with assistance from police in Camrose. Enright said Thursday he has not been in court yet. He denied making any threats. 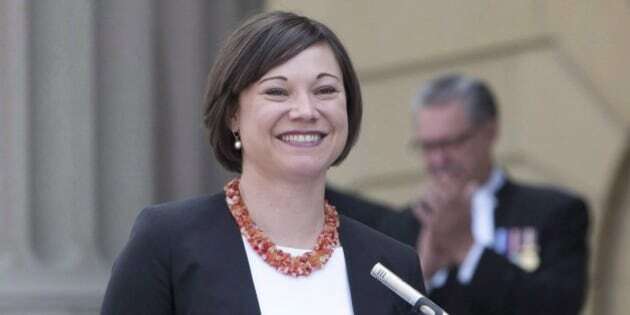 Enright said he was driving and listening to talk radio host Danielle Smith, former Opposition Wildrose leader in the legislature, when he called Phillips's office. "I'm listening to Danielle Smith talking just one thing after another about — whatchamacallit — the economy and the coal. I've got friends who are losing their jobs, and I phoned in,'' he said. "I didn't mean to get upset and I did not threaten anybody at all. All I said was that if they (the NDP government) keep pushing people, people are going to get guns and they are going to revolt. "I've got friends who are losing their jobs." Enright said the whole thing has been blown out of proportion. He said if he thought it would make amends, he would write the office an apology letter and do even more for the female staff member with whom he spoke on the phone. The maximum penalty for uttering threats is five years in prison. None of the accusations has been proven in court. Premier Rachel Notley and other members of her cabinet have been the target of threats in recent months. Some people have posted messages on Facebook and other sites threatening to kill the premier. There have been no reports of any charges laid as a result. The threats spiked last December when Notley's government passed legislation mandating safety rules on farms and making paid farm workers eligible for workers' compensation. Energy Minister Marg McCuaig-Boyd tearfully recounted in the legislature that she had been harassed and threatened over the farm bill. Phillips has said on Twitter she gets angry and abusive messages daily on social media. The carbon tax, set to begin on Jan. 1, is part of a climate-change plan introduced last November by Phillips and Notley. The tax, designed to give consumers an incentive to move toward greener energy alternatives, will increase the cost of everything from gas at the pumps to home heating and electricity. The province is also moving to shut down all coal-fired electricity plants by 2030. That has led to concerns about job losses and a harmful domino effect on communities.